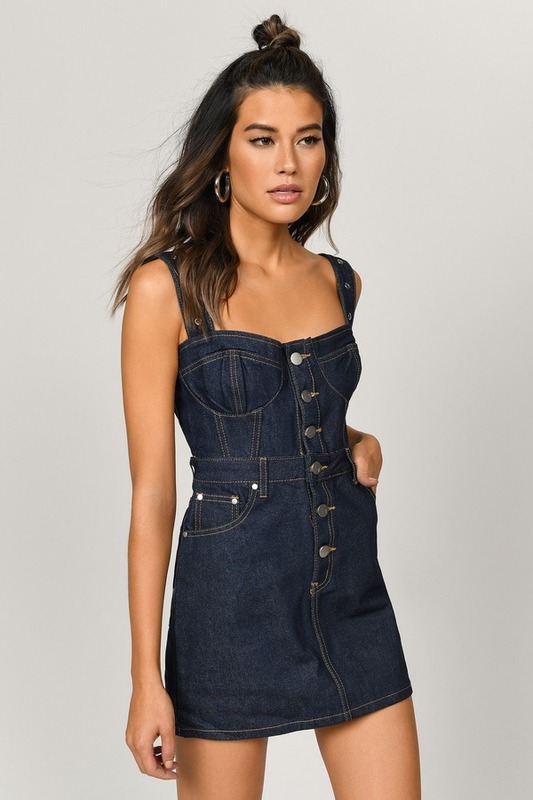 Check out Tobi's Maple Bustier A-Line Denim Dress Denim for date night? Yassss all the way. The Maple Bustier A-Line Dark Blue Denim Dress will make a fab impression. This mini sleeveless dress features button details, pockets, eyelets at the straps, and a bustier fit. Perfect for daytime drinks or nighttime soirees, pair this jean dress with heels or boots! Denim for date night? Yassss all the way. The Maple Bustier A-Line Dark Blue Denim Dress will make a fab impression. This mini sleeveless dress features button details, pockets, eyelets at the straps, and a bustier fit. Perfect for daytime drinks or nighttime soirees, pair this jean dress with heels or boots! Dark Blue modeled on a size Small.